Float Your Boat with The Official Boat Party for Carl Cox 'Music is Revolution' at Space Ibiza, happening every Tuesday from 7 July to 22 September. The FYB Carl Cox opening party sees Uner on the decks of the custom Pioneer XY Pro-Audio Sound System, delivering techno against the backdrop of sun and sea. 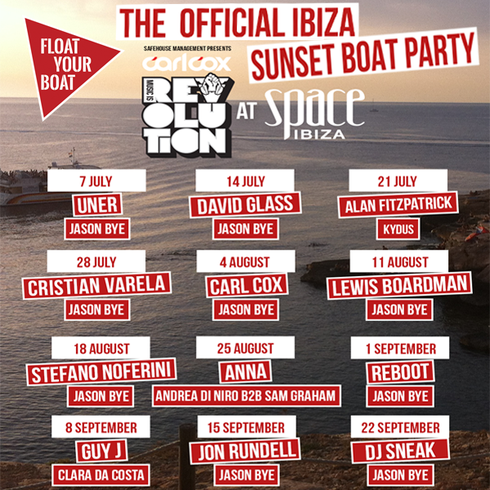 Throughout the summer Float Your Boat aims to showcase the biggest and best techno and house DJs in the world. Leading the charge is Carl Cox, founder of the Intec Records label. Joining him are the likes of Cristian Varela – twice voted the world's best techno DJ, Chicago’s DJ Sneak, Jon Rundell, Reboot and many more. Float Your Boat takes your island adventure to a level of “big smiles, new friends, awesome music and the best sunsets in the world,” says promoter Charlie Keegan. Your FYB Carl Cox at Space ticket gets you boat entry and free transport and entry to Space Ibiza for Carl Cox’s 'Music is Revolution’.